When your child has eyeglasses, you want to make sure to instill in them proper eye care lessons. This, of course, can be used while they’re children but be just as useful when they get older. When children know how to care for their eyeglasses, you can ensure that their glasses will last longer. By making sure their glasses don’t get scratched or broken, you can save money, as they won’t be having to replace them. You might be wondering, how do you teach your child proper eye care? In our last blog we discussed correct cleaning and protection methods to keep your child’s glasses protected. We went over how glasses are meant to be cleaned with warm water and a cleaning cloth, while eventually stored away in a hard-shell glasses case. By using these two things you could significantly prolong the life of your child’s eyeglasses. In part two of this blog series we will delve into uses of eyeglasses, such as putting on and off and where to properly use your glasses. Children naturally have rambunctious tendencies. They often like to fidget and play around with things around them — sometimes with things they shouldn’t. Because children are naturally a little more energetic, they tend to play around with things such as clothing, their hair, and yes, their glasses. One way to keep them away from their glasses is to tell them how their fingers create smudges, which only make it harder to see. Part of the issue with kids playing with their glasses is that they take their glasses on and off their face. It is easy to play around with their glasses, however, it also is just as easy to lose them. For instance, they can play around with their glasses, take them off, and set them down somewhere and, in just one motion, you are out more than $100. One way to prevent this likely scenario is to attach the ends of the glasses with a string. By just attaching the ends of the glasses, you automatically reduce the likelihood that your child will lose their glasses. Sure, they might still play with them, but they will be less likely to play with them and drop or lose them. Either way, no matter what you do, your child will continue to play around with their glasses, but with this technique, at least you don’t have to worry about them absentmindedly setting them down somewhere. By having a string attaching the glasses, you also prevent the likelihood that their glasses will fall off their face. As stated, children are energetic, which means they like to play. Sometimes while playing, they can get a little carried away and their glasses can fall from their face. The good news is if they have a string attaching their glasses, if they fall off, they hang around their neck away from the ground where they can be stepped on. Because children can be very active, it is never a good idea to bring their glasses when they are playing sports or on a playground. For one, glasses can be easily broken due to collisions or stumbles. One way to reduce the threat to their glasses is to purchase vision goggles. Vision goggles for younger children are perfect because they are durable and resistant to any rough-play. Best of all, vision goggles come complete with your child’s prescription, so they can see and play to their heart’s content. Vision goggles are a good idea if you have a lively child, however, the older the child, the more able they will be to use contacts. Contacts are a nice substitute for glasses because they are constructed with your child’s prescription and are not at risk of breakage. However, contacts require care and attention, the younger the child, the less likely they are to care for their contacts. If your child was born with any eye issues, you should bring them to a pediatric optometrist office. There, a medical professional will be able to see and check your child’s eyes. Not only that, an optometrist can also work to help treat your child’s vision deficiencies, such as lazy eye, astigmatism, or any other eye-related issues. 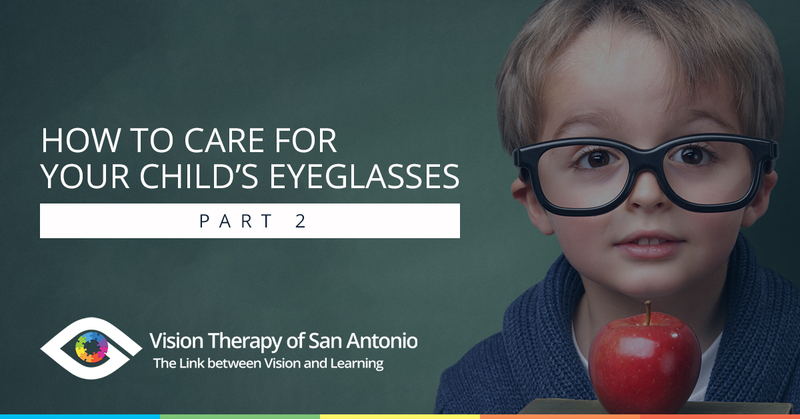 Organizations, such as Vision Therapy of San Antonio, can help your child with methods such as vision therapy. By using this treatment, your child’s vision could be significantly improved, which could mean they might not even need their glasses anymore! Though eye therapy is no definite cure to eye issues, by practicing eye therapy techniques, your child’s vision can be improved and their prescription, lowered. Either way, your child could benefit from eye therapy! If you are in the San Antonio area and are curious about lazy eye treatment or eye therapy, contact Vision Therapy of San Antonio today!